On June 17, 1932, 17,000 United States military veterans of World War I and 25,000 of their friends and family gathered in Washington, D.C. to demand early payment of their service certificate war bonuses. Although the bonuses were not due to be paid until 1945, the Great Depression had hit the United States and these veterans were floundering financially. 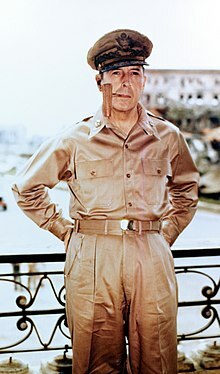 General Douglas MacArthur, chief of staff of the Army, personally led US troops to forcibly drive away his fellow veterans, even though future 5 star general and president, Maj. Dwight Eisenhower (serving as an aide to MacArthur) counseled him not to have anything to do with the eviction. Maj. George Patton, future General and World War II hero, personally led a cavalry charge against the protesting veterans, including a man that had saved Patton’s life during World War I. The use of military force against unarmed US war veterans is just one of 10 arguably shameful or stupid things we are listing here to demonstrate why some people think that Douglas MacArthur was a jerk, not a hero. Questions for students: Do you agree with MacArthur’s critics? Was he a hero or a jerk? Please tell us what you think in the comments section below this article. 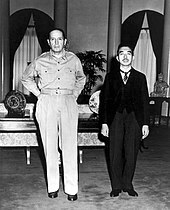 Although the Japanese could have been defeated sooner had the US followed a different strategy, MacArthur insisted on retaking the Philippines first to satisfy his own ego and make good on his “I shall return” boast. What an ego! Perhaps “We shall return” would have been more tactful. 9. Acceptance of Payoff from Philippines, 1942. A dirty little secret kept quiet until 1979 was the fact that MacArthur, already paid as a US general and also as a Philippine Field Marshall at the same time, was paid a $500,000 bonus by the president of the Philippines. By contrast, Dwight Eisenhower was also offered money by Philippine President Quezon but had the class to refuse it. Upon assignment as Chief of Staff of the Army, MacArthur took to calling himself “MacArthur” in some sort of convoluted “royal we” form. He also worked at his desk wearing a fancy Japanese kimono and smoked his cigarettes in a jeweled cigarette holder. Not only did he rashly make the boast about returning to the Philippines, but when he did return he was dropped off the landing craft ramp right onto the beach. That would not do for this publicity hound, so he had the landing restaged and refilmed so that he got off in the water and waded to the beach. 7. Got That One Wrong! 1944. On December 26, 1944, MacArthur announced that the island of Leyte (an important island of the Philippines) was secure and only “mopping up” was necessary. After that announcement, over the next several months over 27,000 Japanese were killed on Leyte. Around the same time, General Willoughby estimated there were about 134,000 Japanese troops defending the island of Luzon (the largest Philippine Island), the next major target, and MacArthur derisively called that “bunk,” when in fact there actually were 287,000 Japanese troops on Luzon. 6. Immunity for War Criminals, 1945. MacArthur gave the dreaded Unit 731 members of the Japanese Army immunity from war crimes charges after the war in order to get their research on germ warfare and other human experiment results. These murderous psychopaths escaped justice because of MacArthur’s miscalculation. He also refused advice to force Emperor Hirohito to abdicate even though many members of the royal family asked him to force the abdication. Royal family members were not prosecuted for war crimes even though the Emperor and some of the others certainly deserved to be prosecuted. 5. Miscalculation About Chinese, 1950. After successfully kicking the North Koreans out of South Korea and moving right up North Korea itself, MacArthur was warned that the CIA estimated about 200,000 Chinese troops were now in North Korea with more to follow. MacArthur scoffed at such information and US forces were surprised and over run when the Chinese masses attacked. MacArthur’s reaction was to contemplate the use of radioactive poisons against the enemy! 4. Fired for Insubordination, 1951. After running his mouth time and again second guessing the President and national policy, thus undermining the US war effort in Korea, MacArthur was relieved of command, a humiliating end to a long career. President Truman was struggling mightily to avoid World War III springing out of the Korean War and MacArthur was personally baiting the Chinese and advocating widening the conflict. 3. Medal of Honor travesty, 1942. After being evacuated from the Philippines, leaving his troops to death and misery as prisoners of the Japanese, MacArthur was awarded the Medal of Honor for political reasons, despite the fact that he showed no heroism or particular efficiency in losing the islands. In fact, he was huddled up in an underground bunker and refused to go outside to see the situation or to rally the troops. He was derisively known as “Dugout Doug.” Dwight Eisenhower objected to this award personally to General Marshall, but was over ruled. 2. Loss of Philippines, 1941-42. Despite warnings from Washington and news of the Pearl Harbor attack, the MacArthur led US and Filipino forces were taken by surprise so thoroughly that the air forces available to MacArthur were destroyed on the ground right off the bat. Though told repeatedly to initiate the war plans, MacArthur did nothing, despite his air officer asking permission to attack Japanese bases in Formosa. Despite outnumbering the Japanese, MacArthur managed to lose the strategically important Philippines anyway. In his haste to escape the attacking Japanese, MacArthur abandoned Manila and declared it an open city without any consultation with the US Naval commander resulting in many tons of US supplies burned to avoid capture by the Japanese. 1. Suppression of Bonus March, 1932. It is bad enough that a veteran Army officer would order troops to attack war veterans down on their luck, but MacArthur insisted on leading the operation personally, bizarre for an Army Chief of Staff to do so. Perry, Mark. The Most Dangerous Man in America: The Making of Douglas MacArthur. Basic Books, 2014. 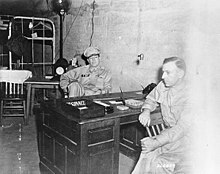 The featured image in this article, a photograph of Gen. MacArthur signing the Japanese surrender instrument from http://www.history.navy.mil/photos/images/ac00001/ac04627.jpg, is a work of a sailor or employee of the U.S. Navy, taken or made as part of that person’s official duties. As a work of the U.S. federal government, the image is in the public domain in the United States.